Alleged Sony Xperia Z Ultra sequel looks amazing, but is it the real deal? The most phab phablet yet? Is this Sony's next phablet? While Sony is busy preparing the landscape for the forthcoming Xperia Z3 handset, rumours emanating from the Chinese media have suggested the firm might also have something a little bigger on the agenda. 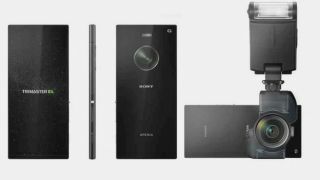 Renders of an alleged 'Xperia Z3X' device, a phablet to succeed the Xperia Z Ultra perhaps, have emerged at Digi-wo.com along with a collection of rather impressive would-be specifications. The virtually bezel-less 6.14-inch ZX3 would come with a 2560 x 1152 Sony's Trimaster EL OLED display, which would be the first of its kind for a gadget smaller than the current 7.4- to 25-inch production ranges. The photos also show a massive camera sensor on the rear of the device, perhaps even larger in physical size than the Lumia Pureview camera phones. The accompanying specs peg the sensor at 22-megapixels. If the renders are the real deal, it also seems as if Sony would be looking to market the device as a camera replacement, judging by the substantial accessories also pictured. Keeping the blockbusting specs coming, the rumour also speaks of a 64-bit octa-core Snapdragon 810 processor doing the donkey work. All of that would be squeezed into a chassis measuring up at 69.5 x 150.1 x 7.9mm. What do you think? Does the Xperia Z3X look a little too impressive to be true or are we really looking at the flyest phablet on the block? Share your thoughts below.